Prior to the Thanksgiving Holiday, students, faculty, administration and staff share a celebrative meal and an assembly program focusing on our gratitude. This new school tradition promotes a sense of community. Advisory groups host the family style meal that includes members of the Maintenance Department, Security and Support Staff. The assembly program for the day highlights a particular theme each year such as thankfulness, sustainability of the earth’s resources, or awareness of native cultures. It is a day for taking time to appreciate the people with whom we live and work as well as the world in which we live. To read more about the 2013 Communal meal, click here for our news post. “Sixty Seconds of Peace” is a tradition established at the HM Dorr Nature Lab. The Head of the Upper Division honored the Social Artist’s request that the practice be used during each Upper Division Assembly. During the past two years it has also been part of our Upper Division Graduation Ceremony. It is a period of silence. It represents the importance of ritual, reflection and the possibility of silence and focus in the midst of our busy lives. During September, 2013, Horace Mann planted a “Peace Pole” on each of our four campuses (Nursery, Lower, Middle/Upper and Dorr Nature Laboratory) displaying the message: “May Peace Prevail on Earth; May Peace Prevail in our Nations; May Peace Prevail in our Communities; May Peace Prevail in our Hearts.” At companion assemblies, Arun Gandhi (grandson of Mahatma) spoke to us on the daily practice of peaceful consciousness. The assembly closed with a World Flag Ceremony, led by the visual artist and Peace Representative Uran Snyder. To read more about these events, read our news post here. Read the news article from The Record - April 10, 2015. On April 7, 2015, Social Artistry HM hosted guest artist Craig Weir, renowned bagpiper and World Peace Tartan Ambassador from Dundee, Scotland. Craig performed a set of pieces interspersed throughout a vibrant presentation about the history of the bagpipe and the mission of the World Peace Tartan. He spoke about his work with Arun Gandhi and the Dalai Lama. Students, teachers and administration were reminded of the principles behind the 2013 “Peace Pole” Assembly, where Mr. Gandhi was keynote speaker. Craig has received numerous awards including a Dundee Hero Award in 2012 for Performer of the Year, an Angus Cultural Ambassadors Award for his band, Gleadhraich, and the 2014 Young Scots Award. 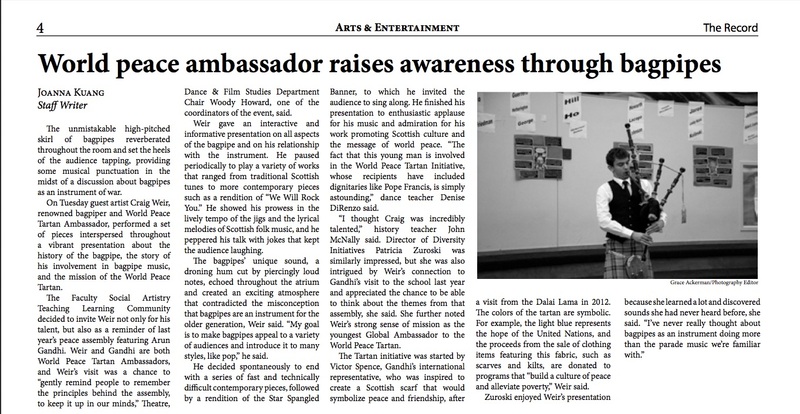 Craig was also honored with the title of Global Ambassador to the World Peace Tartan in 2014. Later in the week Craig had performances scheduled at the 9/11 Memorial, Ellis Island and the Tartan Parade. As part of the 50th Celebration of the Dorr Nature Lab at Horace Mann School, former Abbess of the Zen Center of New York City, Bonnie Myotai Treace, led the community in a Water Mala Ceremony, a ritual of blessing and mindfulness. Sensei acknowledged our connection to the aquifer that nourishes both the land and us. She raised to our awareness a sense of the blessing that water is in our lives and our duty to protect it. Four students assisted in the ceremony by helping to fill 108 small bowls. Everyone was invited to take home one of the bowls, to place it on a windowsill and maintain the water as a mindfulness practice, “giving attention to water.” At the end of the ceremony, several white doves were released. Myotai Sensei is the founder of the Hermitage Heart in Garrison, NY.